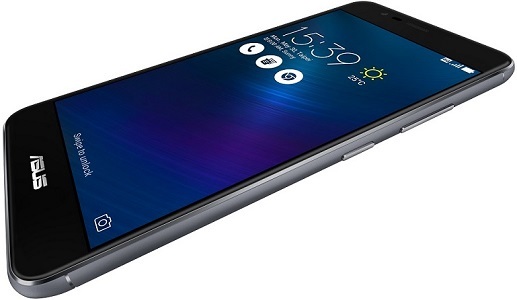 India, December 19th, 2016 – ASUS, the Taiwanese leader in mobile technology, today announced the availability of Zenfone 3 Max 5.5 (ZC553KL) in India. Priced at INR 17,999, the stunning smartphone can be purchased on select ASUS Preferred Partner’s retail outlets and all major Online Sales Portals. The 5.2 inch variant (ZC520TL), which was launched along with Zenfone 3 Max 5.5 last month, is already available at INR 12,999. Keeping in line with ASUS’ ‘design thinking’ philosophy, the beautifully constructed Zenfone 3 Max 5.5 features a 2.5D contoured glass touchscreen in a finely sandblasted full-metal, aluminum-alloy body with brilliant diamond cut chamfered edges. To reduce bulk, the sleek smartphone is surrounded by a 2.25mm bezel that gives it a high 75% screen to body ratio. Built to keep up with the active lifestyles of the consumers, Zenfone 3 Max 5.5 has an extremely long-lasting, high-capacity 4100mAh lithium-polymer battery, giving users the freedom to use it for extended lengths without the need to charge it – with up to 38 days of standby time on 4G, 17 hours of talk time on 3G, 72 hours of music playback, 18 hours of video playback and 19 hours of Wi-Fi Web browsing. It also doubles up as a fast-charge power bank for charging other devices. The device also comes with an in-box USB OTG cable for reverse charging, file transfers as well as to connect to USB peripherals. For optimal performance, the smartphone also offers five selectable power modes that enable users to regulate their usage according to their specific needs – Performance mode, Normal mode, Power saving mode, Super Saving mode and Customized mode. Zenfone 3 Max 5.5 is a treat for photography enthusiasts. With its 8MP + 16 MP (front + rear) cameras, the smartphone ensures stunning, high-resolution photos with zero shutter lag. The 16MP f2.0 camera of the Zenfone 3 Max ZC553KL features triple technology autofocus system which ensures a superfast focus time of 0.03 seconds.— laser, phase detection and conventional contrast detection for continuous auto-focus —that automatically selects the best one depending on the subject, lighting and range. For videos, an electronic image stabilization (EIS) system counteracts hand movements to ensure the resulting videos are stable and shake-free. Moreover, ASUS’ iconic PixelMaster camera is equipped with powerful camera modes to ensure that every moment is captured perfectly. The industry-leading Backlight (Super HDR) mode lets users see clearly through daytime shadow, Super Resolution captures multiple shots simultaneously for a single photograph with stunning 64MP detail and Low Light mode takes clear and bright photos, even in poor lighting. Zenfone 3 Max (ZC553KL) is equipped with a powerful Qualcomm Snapdragon 430 64-bit octa-core processor. Together with an Adreno 505 graphics processor, the smartphone delivers outstanding performance to support even the most graphically demanding games. Despite its incredible performance, the smartphone weighs only 175 grams and is up to 8.5mm thick at the sides, making it one of the lightest and most compact smartphones with a battery that is more than 4000 mAh in capacity. With security being a concern, the smartphone has a fingerprint sensor that is conveniently positioned near the top of the rear panel, allowing the user’s index finger to rest naturally upon it. Through this, the user can rapidly lock or unlock the phone, or utilize it for app authentication. The sensor functionality is integrated with the camera as well, allowing you to double tap to open the PixelMaster Camera app, and a single tap to capture the photo. It registers up to five separate fingerprints and accurately detects fingerprints regardless of the orientation of the finger on the sensor in as swiftly as 0.3 seconds. Both variants of Zenfone 3 Max (5.5 inches and 5.2 inches), priced at INR 17,999 and INR 12,999 respectively, are available on select ASUS Preferred Partner’s retail outlets and all major Online Sales Portals in three stunning metallic colours – Titanium Gray, Glacier Silver, and Sand Gold. Slim 2.25mm bezel and 73% screen-to-body ratio. Paytm Introduces Mobile Wallet Top Up Feature In ATMs!